Phoenix Sky Harbor is located about six miles East of downtown Phoenix, Arizona, the seventh largest U.S. city and Arizona's State Capital. The airport can be entered from the East using the Sky Harbor Blvd. exits from AZ 143, AZ 153, or Loop 202 freeways. The West entrances are Buckeye Road, Sky Harbor Blvd. from 24th Street or the Sky Harbor Blvd. exit from I-10. 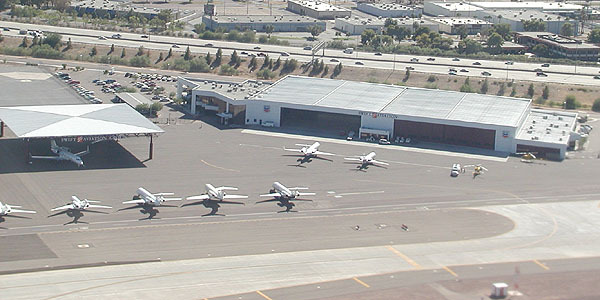 Sky Harbor is the Valley of the Sun's primary airport, and is the airport with the most scheduled airline services. It is served by many airlines on a regular basis and several cargo and charter airlines. There are many aviation related business on the airfield. Honeywell maintains a large facility here, which produces aircraft engines and auxiliary power units for many of the world's planes. Sky Harbor has hosted some air show events in the past, including the public open house when Terminal 4 was finished. With all the aircraft operations, such events aren't commonplace. However the airport is quite accessible for spotters and photographers, with many good locations for viewing aircraft operations. Use our PHX Maplinks Page to find some of the areas in and around the airport for observing aircraft. Our Airline Info Page is a list of the airlines which serve this airport on a regular basis with their phone numbers and URL's (where available). This page also has hyperlinks to our other PHX information pages. The PHX Nonstops Page is a listing of the destination airports that are served nonstop from PHX, and includes the airlines and equipment that fly these routes. Selected recent Aircraft Movements and Business Aircraft Movements can be found on these pages. Thanks for Visiting PHX. (back to Homepage)!